When I worked out it would be £220 for the pair of us to go to Budapest (flights and accom) I couldn't resist! He hadn't stayed in an Air BnB before and I found some amazing apartments so I went with one of those and flights from easyJet. A month before going I started planning our trip, starting with his actual birthday (the day we arrived on). I've always had a thing for researching and planning especially trips so this was all a lot of fun for me. We stayed Tuesday til Friday and the weather was sunnier and warmer than the UK but not by much, we still wore coats but we even got to take them off at some points, which we took full advantage of. Budapest is such a beautiful city, it reminded us of a mixture of Barcelona and Amsterdam. The buildings were detailed and the main streets were huge and then the little cobbled side streets well they are always cute. This was my second time staying in a rented apartment, the first time was in a shared one in New York. This time as it was me and my boyfriend I went for a private one. I didn’t look into where was best to stay in Budapest, I just wing'd it and very glad I did because we ended up in walking distance from most things. We only got an Uber twice (shameful I know) and the metro a few times when we headed across the river to Pest. The apartment was situated on a Main Street (there was a McDonald’s and a h&m on our doorstep) and a metro stop which was handy. Larger than I expected, the apartment had tall ceilings and the most perfect flooring. There was a kitchen/living room, kept minimal with only a kitchen, a sofa bed, a chair an old white furnace. It had two vintage wall hangings on each walls and the coolest window shutters. In the hallway there were wooden steps leading to our bed and underneath our “bedroom” was the bathroom that seemed to have more of a modern feel to it. I chose a pretty good apartment and the hosts were very informative about Budapest and the location. I had heard about this place but didn’t add it to the plan but as it was on our street and we were hungry we headed there after settling in. It was obvious that the interior decor and the atmosphere were the cause of it being so popular because it most certainly wasn’t the food. The food wasn’t terrible but it wasn’t what was expected but mind you we only went with “New York” style lunches (burger and crisps). When I saw this place online I decided straight away this was where we were going for Rakesh's birthday meal. It had a good selection of BBQ food so just went with it (very brave decision when your boyfriend is a foodie). Modern design, and as the name states it’s designed based on an airport terminal. Everything in there was branded with a clock logo, even the tables. The food was wow, to die for. We were actually quite apprehensive on the first glance at the menu but we made it work. We went for the ribs, mac and cheese and the Reuben sandwich (brisket etc). We left feeling uncomfortably full but in the good way. Saw this place through Instagram and had to go here as the eggs benedict looked delicious. Just a short and lovely walk away on the corner of quieter street. We started with mimosas to help with our hangover and ordered our egg dishes. We read/looked at photographs in a few magazines and enjoyed the slow morning. 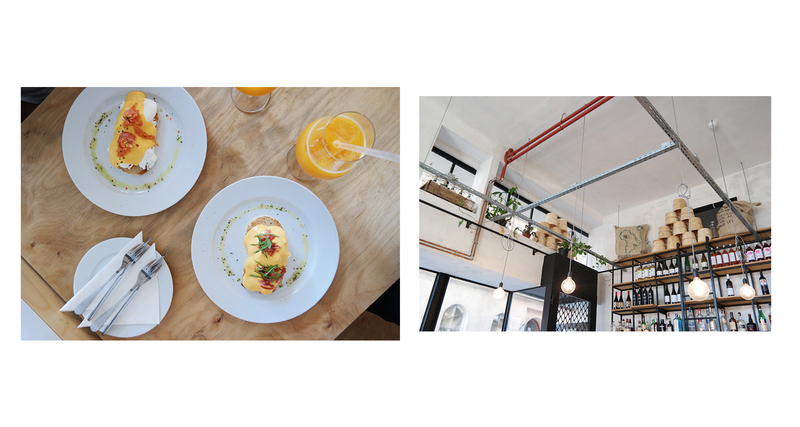 The eggs Benedict and florentine were just as delicious as they looked on their Instagram, the only thing is we wished there was more of the ham and the salmon! You know when you get sick and tired of scrolling through trip advisor in search of a decent restaurant well this happened to us on one of the evenings and being hungry doesn’t help at all. But hoorah for Padron, a tapas restaurant that actually caught our eye. We hadn’t ventured out to this area yet (15 minute walk opposite the general direction) it was a lot quieter and less built up of shops etc. We had good feelings about it after just moments of being inside. We ordered a hell of a lot of food (Padron peppers, patatas bravas, garlic mushrooms, pork ribs, croquettes with jamon, pigs ear and spicy cod). We went for a walk for night time views of the parliament building and ended up walking for miles and then more miles because we couldn’t find any restaurants but there it was our first hidden gem! We stepped inside and got a bit excited because it was a fish restaurant and even had the fish on the counter. I went for prawn spaghetti and Rakesh went for the fish platter and we got chips and salad for sides. When it arrived I got major food envy (it’s usually the other way around) but it’s lucky I have a boyfriend who loves to share/feed me! The restaurant had a rustic/modern feel to it, with bare brick walls painted white, with modern furniture and lots of black chalkboards. 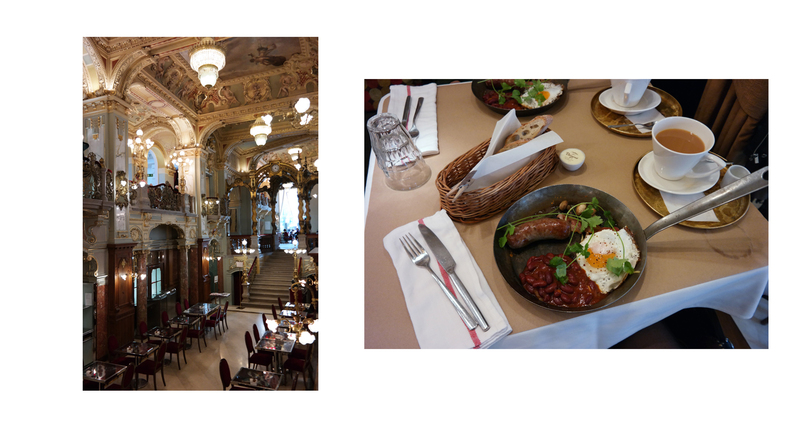 We were very lucky to find this bistro on trip advisor on our last morning, this place was in Pest so we had to get the metro and it was so worth it. We had luckily packed up by 10am then headed out. It’s hard to explain in words at how stunning this place was so I’m hoping these photographs do it justice. It was huge and it was a mixture between vintage and modern. I still can’t explain but let me tell you now, being a bit of a brunch queen this food was a 10/10 from both of us. Usually abroad you go for the “English” breakfast and you get a bad fried egg with a small tinned hot dog kind of sausage with toast and jams. Here you go for the English breakfast and you get it but 10 times better, a huge flavoursome sausage, spicy (kidney) beans, mushrooms, bacon, fried egg on a bed of crispy shredded potatoes (like crisps) and topped with coriander! It was also Instagram perfect with the cast iron pan ;). The service was really good and the waitress asked us if we wanted something sweet “if the breakfast was good, imagine how good the sweets are” so Rakesh went for a slice of chocolate cake and I went for a huge raspberry meringue (that I finished on the plane home) We kind of wished we found it sooner so we could have tried it for dinner so yes a big recommendation from us. Ruin Bars (Anker & Szimpla Kert) We planned to check out bars but didn't really research into the ruin bars as I had a feeling we would just walk into them, which we actually did! Both had really good atmospheres for a weekday and both had really different vibes from each other. Anker was a lot more modernised and minimal and Szimpla was just crazy interesting, there's random objects everywhere and a lot of different rooms and spaces. I'm glad we decided to check it out considering we were so full up from dinner. We were too tired to pop into here (lame excuse) but from the outside the store looked so good! I wanted to buy a lot from this store but Rakesh left with copper finish tweezers, it's the worst spotting nice things when your carry on case is very full up. There were these lovely circular concrete candleholders that caught my eye! Copyright Honest Blog. Premade design by gatto.